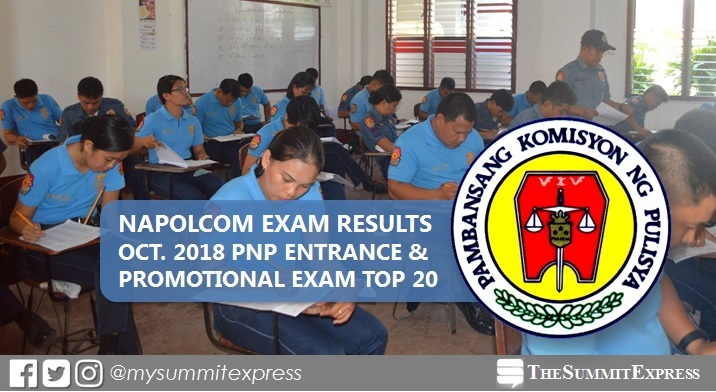 MANILA, Philippines – The October 2018 National Police Commission (NAPOLCOM) exam results for Philippine National Police (PNP) Entrance and promotional exam are out online on Wednesday, January 9, 2019 or in 2-3 months after the tests. View on this page the list of topnotchers or top 20 passers. The second regular exam in 2018 was conducted on October 21 in designated schools in Metro Manila and other testing centers nationwide. NAPOLCOM said a total of 45,514 takers for PNP Entrance and promotional categories tried to hurdle the exams. The Summit Express will update this site immediately once results are out online. We advise takers to keep tuning in on this page. You may also visit the website of NAPOLCOM (napolcom.gov.ph) for more information.